When her mum marries the King of Enchancia, Sofia must adapt to an extraordinary life of royalty! Along the way she is getting support from one of her best friends, Jade and today they are celebrating their special friendship with this fabulous tea party set. The dolls also unlock phrases in the Magical Talking Castle set, sold separately. General information: One supplied; Size H16.5, W25.5, D4.5cm; For ages 3 years and over; EAN: 0746775235147. WARNING(S): Not suitable for children under 3 years old. 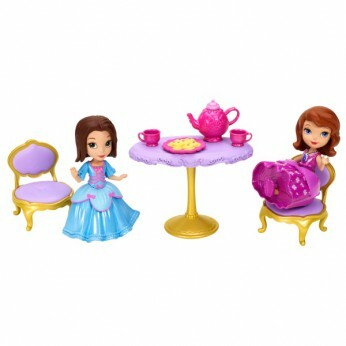 This toy costs approximately £12.99 (for the latest and best prices make sure you check our retailer list for the Disney Sofia the First Royal Tea Party above). In our review of Disney Sofia the First Royal Tea Party we classed it as being suitable for ages 3 years, 4 years, 5 years but recommend you check the manufacturer specific advice before purchasing.